Garden in a City is America’s first garden and landscape design show focusing on urban horticulture. 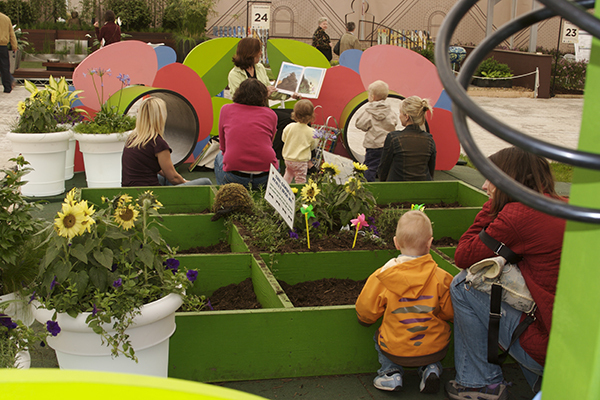 The inaugural season of this in-ground show featured a Children’s Midway where children and families found engaging and educational interactive elements that relate to the greening of our urban community. Giant cutout flowers and enormous plant pots grace the trellis entry. Children crawl-though the flower tunnels and mini-slides to find a garden of fun and activity. The design of the midway accentuates scale and uses ordinary gardening equipment in surprising ways. At the Big Soil Play Area, kids dig and get dirty at industrial troughs of sod and rocks. They plant take-home seedlings and learn to care for them. The nearby trellis supports a musical maze of hoses and sprinklers providing wet and dry routes to meander through. Oversized, “smelly” planters of fragrant flowers line the walk allowing young gardeners to learn to distinguish the scent of lavender, mint, lilacs, grass or manure. At the tent overlooking picnic tables, children make the paper caterpillars, butterflies, and bugs that adorn its canopy. As a center for creative activity, the city’s park district supplies the ongoing programming. There is also a daily parade of children, parents and red wagons filled with plants that marches along the gardens. 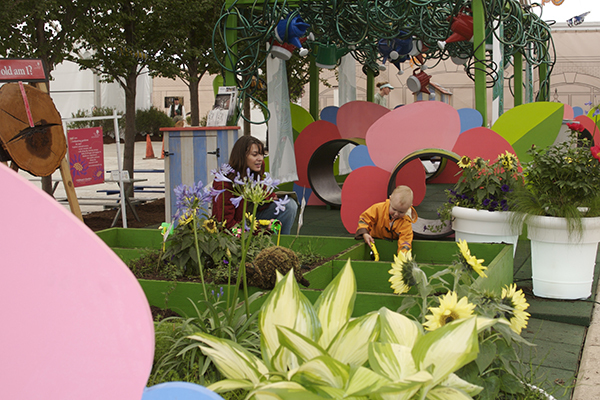 The Children’s Midway creates a similar learning experience about gardening to that which adult visitors have when perusing Garden in a City. Here at the Children’s Midway, hands-on gardening leads to learning how greening our spaces improves communities and the quality of life.